Your shoulder is a complex ball and socket made up of the humoruos (arm bone), the scapula (shoulder blade) and the clavicle (collar bone). There are also many ligaments that help to support your shoulder as well as multiple muscle attachments including the rotator cuff that help the shoulder move. The shoulder is a very mobile joint that allows you to reach and move in any direction. So, when you experience shoulder pain, your daily activities come to a screeching halt. The question is, how can this pain be chased away in order for you to resume your normal movements? There are many different reasons why your shoulder experiences pain. Overhead activities, such as swimming or throwing a baseball, can cause a pinching to occur in your rotator cuff or bicep tendons. Sometimes by sitting poorly you can place increased stress on your shoulder which will result in pain. Other times trauma experienced during a fall or auto accident will injure your shoulder as well. An assessment by your therapist will include an evaluation of your neck, upper back and shoulder to determine the source of your pain. Special tests may be performed to determine which structure is causing you the pain to help guide your treatment plan. 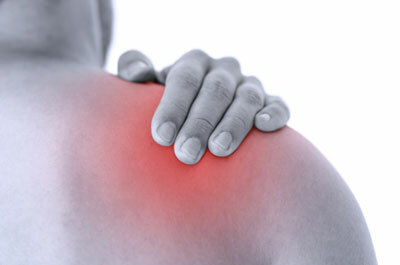 Treatments include stretching, strengthening or stabilizing your shoulder. You will be given an exercise program to perform at home that will help improve your strength and mobility of your shoulder.